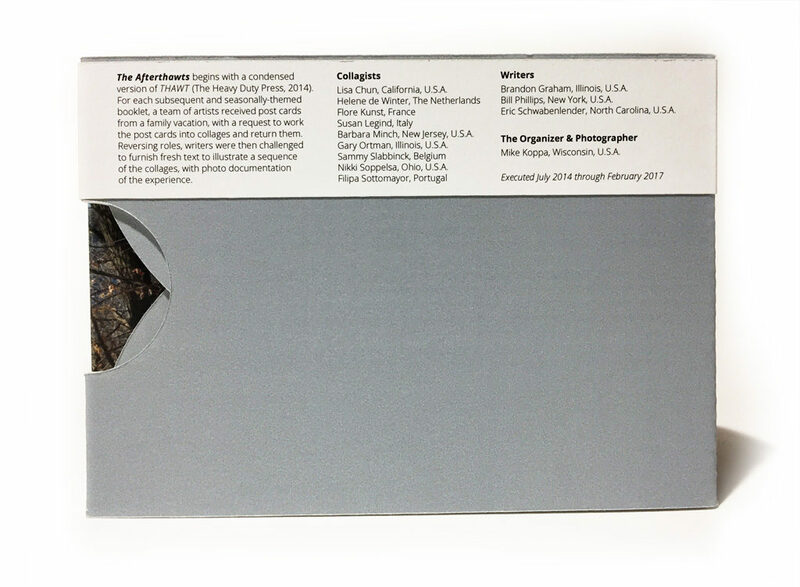 Four booklets, averaging 44 pages each, 4” x 5.75” (horizontal format), digitally printed on acid free 70 lb text, hand-stitched, with an 80 lb cover jacket, in one archival slipcase. Limited edition of 26 numbered copies. The Afterthawts begins with a condensed version of THAWT (The Heavy Duty Press, 2014). 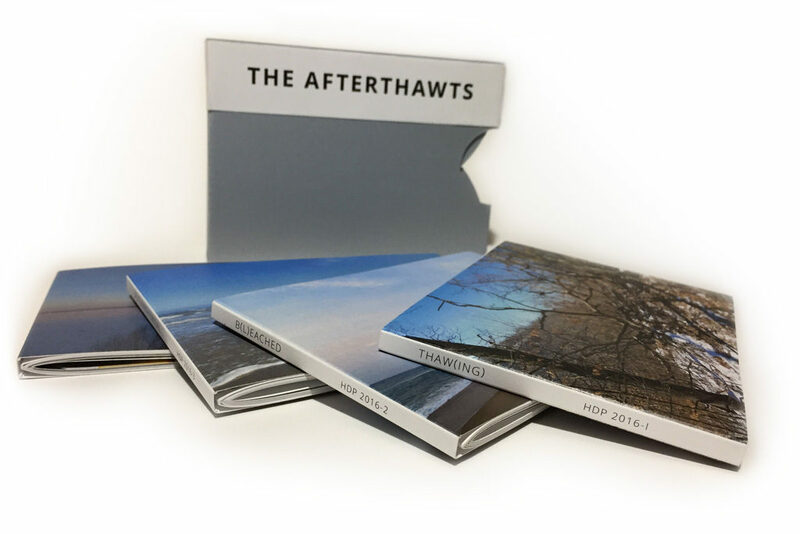 In the tradition of slow media essential to THAWT, each subsequent and seasonally-themed booklet is inspired by post cards from a family vacation sent to a team of artists, with a request to work the post cards into collages and return them. Collages received were then arranged in a specific sequence, with accompanying photo documentation of the holiday. Reversing roles, a creative writer received the image sequence, and accepted the challenge to furnish text to illustrate the images. 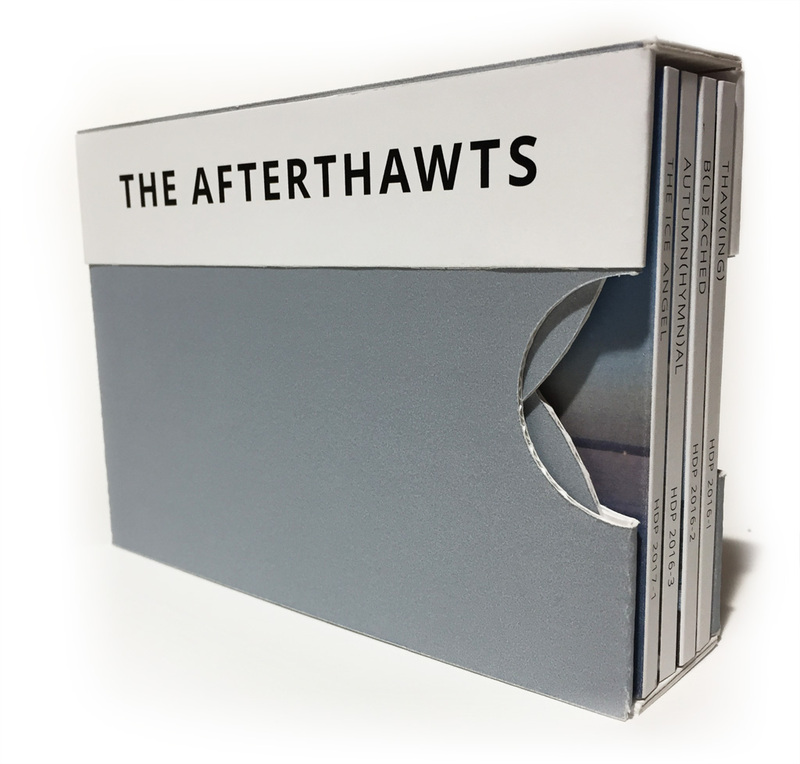 The Afterthawts represent patience amidst the transitions between the chapters of life. Thawt was conceived on 20 February 2013, while hiking on a frozen hillside, above the building slated for conversion into a home for The Heavy Duty Press. I had recently become self-employed as a seasonal laborer, which provided freedom during the winter months to concentrate on creative projects and revive the letterpress operation. The following four years became a chapter of their own. As The Afterthawts sorted themselves out, the old shed became Der Klubhaus, and with this prospectus, one chapter ends and another begins. My sincere gratitude goes out to the generous and talented contributors to this project. Most of them are virtual acquaintances met through the internet, and the two exceptions I haven’t seen face to face in more than 20 years. These are friendships maintained by words and pictures. Barbara Minch New Jersey, U.S.A.
Bill Phillips, New York, U.S.A.
Eric Schwabenlender, North Carolina, U.S.A.
Download free ebook versions of each booklet (click on the images below). Ebook pdfs from The Heavy Duty Press are best viewed on a full size screen with Adobe Acrobat Reader, in full screen mode. To do so, click the link, download the pdf to your hard drive, and open with Adobe Acrobat. Share freely.